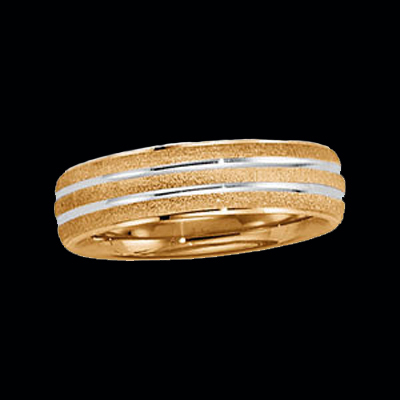 Lovely 14k Two Tone gold wedding band. 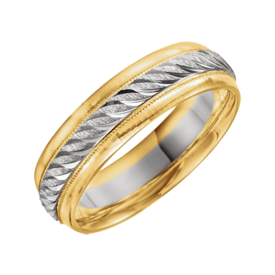 This wedding band features a double milgrain design and is a comfort fit band. Available in 18K yellow and Platinum version, use our request link for pricing. 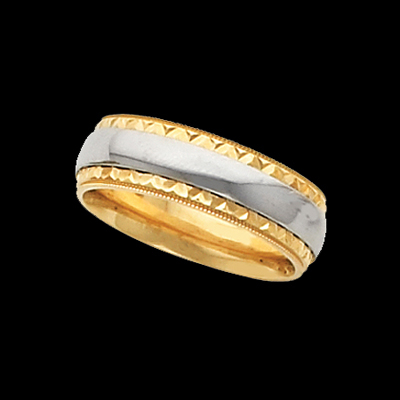 Pretty 14k Two Tone gold comfort fit wedding band. This fancy wedding band features an etched border design with milgrain edge. Center white gold is a simple smooth finished polish band. This wedding band is a delightful combination. 14k Two Tone gold wedding band. 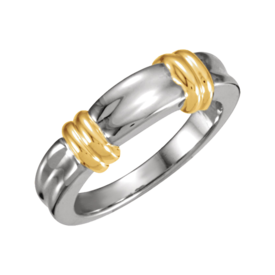 This comfort fit wedding band features a yellow center band with a white gold edge on either side. This wonderful wedding band measures 6mm in width and our price shown is for the ladies size 5 weighing 6.56grams. Great quality, affordable ring. 14k Two Tone fancy wedding band. Ladies band measures 6mm wide, gent's measures 7mm wide. Very attractive ring. 14k Two Tone gold Greek key design comfort fit wedding band. 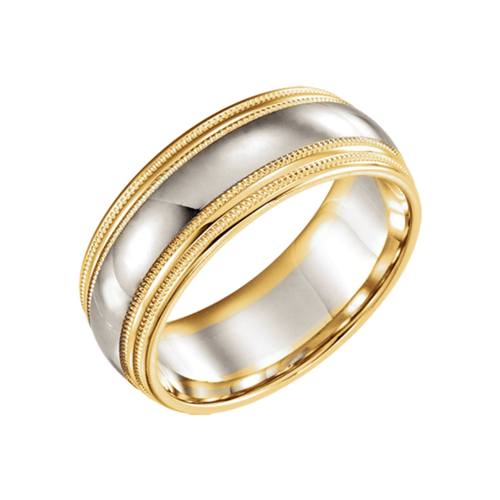 This great wedding band is available in a large variety of whole and half sizes. Price shown is for the size 5, 7.35 gram selection. 14k Two Tone gold Celtic design wedding band. 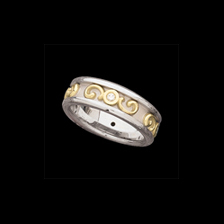 This beautiful comfort fit celtic wedding band measures 7mm wide and is available in a large variety of sizes. 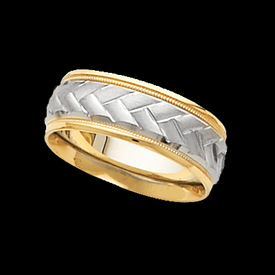 Lovely 14k Two Tone gold weave design wedding band. This Comfort fit wedding band is available in a large variety of whole and half sizes. 14k Two Tone gold Celtic design wedding band. Gorgeous old world design measures 7mm wide and is available in whole and half sizes. Pretty 14k two tone gold wedding band. This beautiful wedding band measures 6mm in width and features a four rope raised style center. Wedding band is a comfort fit design. 14K Two Tone comfort fit wedding band. 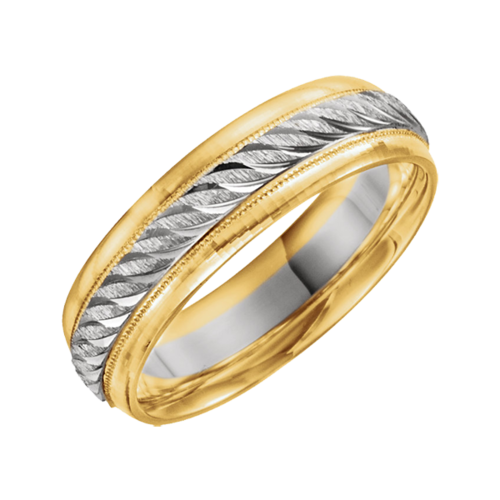 14K Yellow Gold brushed finish complimented by polished 14k White gold band. Ring measures 6mm wide, available in a variety of sizes. 14K White Gold with Yellow Gold accents, 1/6ct tw Diamonds. A Very attractive Band. Three princess cut diamonds add to this rings beautiful design. 14k Two Tone Gold designer wedding band. Available in a variety of sizes, this fancy style is a comfort fit band measures 6mm wide. 14k Two Tone Gold cross design wedding band. 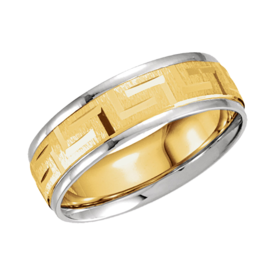 Wedding band features a cross pattern design around the entire ring with a polished cross and matt background. Available as shown or in a reverse pattern. Band measures 7mm wide. 14k Rose Gold bordered with 14k White Gold creates this stylish wedding band. 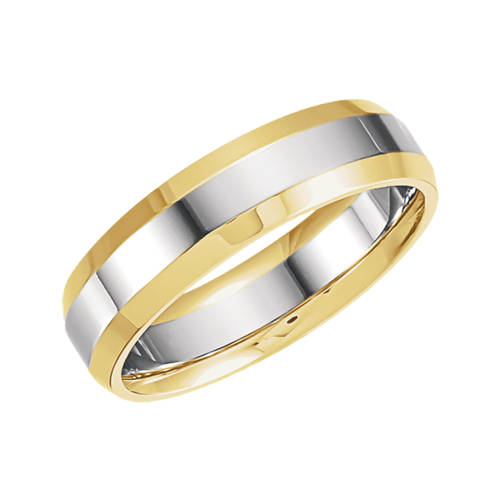 Wedding Band measures 4mm wide, is a comfort fit design, and is available in a variety of whole and half sizes from 5 to 12. Free Engraving~Add a special Sentiment to this great ring. 14k Gold Two Tone Key design band. Ring features double milgrain edge, measures 7mm wide and is available in a variety of whole and half sizes. Diamond Etruscan band. Comfort Fit 14K White and Yellow Gold Etruscan Band with 1/8ct tw Diamonds. Available in several sizes. 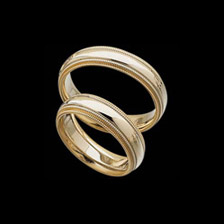 Traditional style 14k two tone gold double milgrain wedding band. This lovely comfort fit classic band measures 5.5mm wide. 14k Two Tone Gold wedding band. This wedding band is a comfort fit inside round design. Also available in Platinum/18Kt Gold, email for pricing be sure to include the item number. Beautiful two tone wedding bands. 14k Gold two tone Claddagh wedding band. Ring measures 13.25mm at the widest point, available in a ladies or gents selection. The Claddagh hands holding the heart symbolize friendship and of course the heart itself is for love. The claddagh crown stands for loyalty. 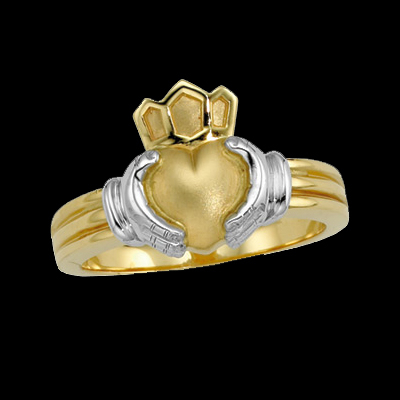 The Claddagh design is a great choice for all occassions, family birthstone rings for mother, wedding rings, wedding bands, engagement rings, of just a beautiful gift.